14 Everyday Uses For 20 Mule Team Borax! You are here: Home / DIY / 18 Everyday Uses For 20 Mule Team Borax! 18 Everyday Uses For 20 Mule Team Borax! Have you ever used 20 Mule Team Borax? I used it when my oldest was a baby. I used it in her cloth diaper pail, yeah, I tried the whole cloth diaper thing… with the first one! The other three wore disposable, for sure! But, I hadn’t tried it again until recently. 100% Natural Mineral. Once it’s removed from the ground, it’s washed, dried and boxed for purchase! It naturally softens hard water, which maximizes your detergents cleaning power! You can purchase 20 Mule Team Borax at Walmart and most any place you can purchase laundry detergent. I also found out years ago that Borax is good for other uses as well. You can use it to clean and freshen things all over your house. One use I found especially helpful and interesting, was years ago we lived “in the country”, and our dogs got fleas and we had a terrible time getting rid of them and keeping them out of the house. A friend told me that she accidentally found out that 20 Mule Team Borax is great for getting rid of fleas! She had spilled some under her kitchen table and when she was cleaning up she found dead fleas under there! She also tried it with sugar ants and said it worked for those as well! Who knew you could use 20 Mule Team Borax for ants? Cut down on water spots in the dishwasher: add 1 tablespoon in the detergent cup. Mix with water to clean your aluminum pots and pans. Soften Hard Water which can make shampoo s and soaps less effective. 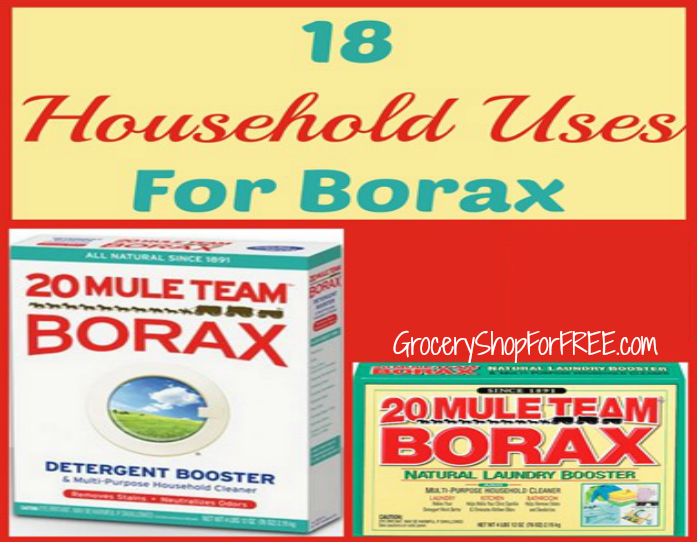 Check out 11 MORE 20 Mule Team Borax Uses <— here! Do you have any other uses or tips for 20 Mule Team Borax? Years ago here in NY state, we had a Siberian Husky diagnosed as having Whipworms. The Vet told me to use 20 Mule Team Borax, sprinkling the ground all along her run with it and I did! Yesterday my Granddaughter in TN called to tell us her puppy was very ill and the diagnosis was either hookworms or parvo at the ER Vet Clinic. The first thing I thought of was that they should cover the ground and apply 20 Mule Team Borax wherever the dog had been, as well as wash bedding etc. using it. She asked, “What is that and Where would I get it?” Her Mom didn’t know but I said………near the laundry soap in the grocery store. I do hope it’s still there. Funny how something like that reminded me or is it that I had 2 mules for almost 27 years……..and some things about MULES we never forget. I bet I have a box down in my laundry cupboard even as I am typing this email! MULES CAN DO IT ALL!!! See my email addy? That’s great! Thanks for the tip! Pinned! Thanks for the tips. We already use it with our homemade laundry soap. Wow! Never tried that! thanks! I didn’t know it was just minerals! I recently bought my first box and love how it aids in my laundry. And my father-in-law just used it to get rid of sugar ants! I t has so many uses I love that! My grandfather used Borax in warm water as a footbath to kill odors. I believe it got rid of fungal infection & softened skin as well. Wow! I hadn’t heard of that one – that’s a great one! Thanks for sharing! While Borax is safe for children & pets, it should be used with caution around small children, cats & small dogs. The powder is very light & easily inhaled. Those tiny little bodies have a difficult time with this & they can get pretty sick! Our vet recommended against using borax in litter and to be very careful when using it for flea control, as it IS toxic to pets. In our case we have cats and a small dog. The 20 Mule Team website does state they do NOT recommend mixing with litter. I love my 20 Mule Team and thought I’d share the info! Thanks for all you do! Thanks I appreciate that! Good to know! I love borax I use it in my laundry daily. I have also used it for fleas. After my step children brought them to my house from their home borax was the way I got rid of them. I put in on my carpet, furniture, washed all the bedding. I even washed my dogs and cat. It was wonderful it worked great when they couldn’t get theirs under control with professionals. It’s such a versatile product! I just bought this from Walmart’s laundry aisle because of it’s many uses, but mainly for stains on clothes because I buy clothes in bulk and rejevanate them when I can. Oh that’s a good idea – using it to cut down on clothin costs because you can buy from yard sales and 2nd hand shops! I love Borax, too. But please note that it is Extremely poisonous to humans and pets. It needs to be kept out of reach of children and pets. (We all know how they will eat all kinds of unexpected things. are not accessible to pets or children. New ant colonies are establisahed by a single fetilized queen that lays hundreds of eggs. larvae and fleas from bedding and carpets. I have an old box of 20 Mule Team and it has become very hard and clumpy. Any hints on how to get it back into powder form? I think the only option os to pour it into another more air tight container and try and break it up with something hard like a wooden or metal cooking spoon. To keep it from happening again, I would take the brand new box and pour it into an air tight container when I got it home from the store. Try a cheese grater to get it back to powder. I love Borax! I will say this because I know how people are about their pets I get it. I do have 3 cats and two dogs. I’ve used Borax for years to treat floors if for some reason we have a flea appearance. Never has an animal of mine became sick from the Borax. I once had a Golden Retriever who became sick with sciopic mange transferred to her from her mom as a pup. I had her at the vet for treatment and after $1000 I started looking up natural remedies and found about Making a paste out of Borax. It worked! Never did she get sick with it again. Wish I’d known before I spent all that money. She is happy and healthy 6yr old today. Wow! That’s awesome about your dog! I know Vet bills are crazy high, so anything we can do at home naturally is always my favorite option!